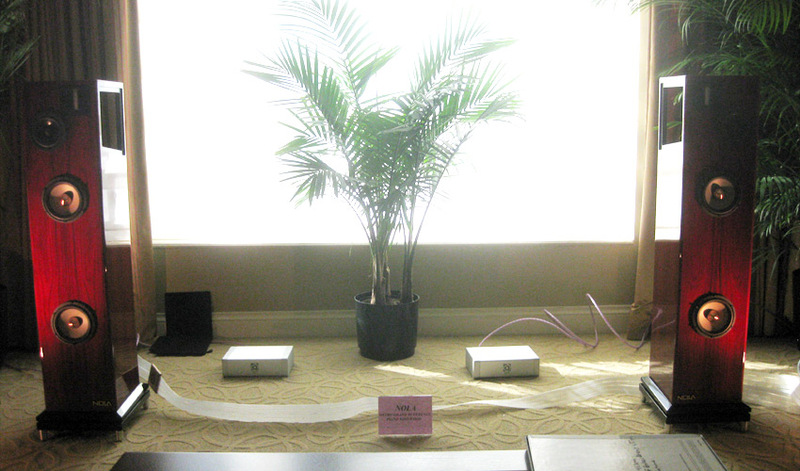 In five days at the 2010 CES, I gained seven pounds. Like many people, when Im bored, I eat. It wasnt the hi-fi that numbed my spirits as much as the walking, the waiting, the squeezing into elevators, the navigating casino floors. After more than a decade of Las Vegas Consumer Electronics Shows, Im burned out by Sin City. Besides, a hotel -- unless its a classic old structure with flat floors and thick, solid walls, where a modicum of room treatment might actually work -- is a lousy venue for high-end audio. At the Venetian Hotel, I heard not a single system that sounded accurate when listened to in the farfield -- and most disserved were those manufacturers that had shelled out beaucoup bucks for the Venetians enormous meeting rooms. Although the soundstaging in such large spaces could be impressive, the tonality, resolution, and timing were unacceptably smeared unless I sat within a few feet of the speakers -- which defeats the purpose of having a big room. To my ears, most demonstrations required a nearfield listening spot, which is not my preferred distance. Sitting within 8 of the center point between the speakers doesnt contribute to the illusion of majesty the way a chair placed farther back does. 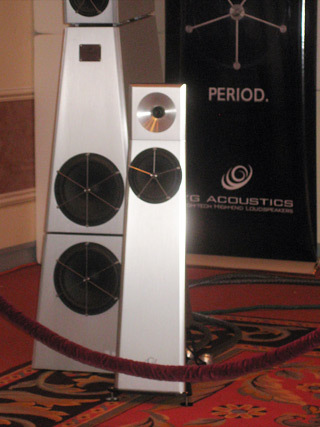 As a result, the best sound at CES 2010 was not as wall-to-wall spectacular as in years past, but listening in the nearfield at least negated the early room reflections, and resulted in the most accurate truth of timbre and the finest detail. In ill-set-up systems, easy scapegoats were the choices of source components. Many a digital front-end sounded congested or metallic; even the gorgeous tones of vinyl were affected by the Venetians strange sunken rooms. Perhaps manufacturers, especially of speakers, should consider frequency-shaping electronics to overcome the hotels two-tiered dimensions. Its telling that the most convincing audio/video demo used a room-correction system. Audiophiles may pooh-pooh the idea, but I think reflection-flattening electronics can give a truer picture of a systems merit than a pot-luck "purist" setup at the mercy of bad vibrations. If digital technology can neutralize room effects without veiling, whats the big deal? I hope someone somewhere is working on software to serve a stereo system the way Audyssey, for example, perfects multichannel sound. Lets hope to see more room correction at the 2011 CES. 16. I was so fascinated by Vincent Electronics Pangea AC-9 power cord that, after the show, I bought one. This garden hose of a cord embodies a lot of design lore, including multigauge geometry, counterspiraled conductors, double shielding, and molded connector bodies, all of which I happen to like. A 5 Pangea AC-9 sells for under a hundred bucks -- but how VE can produce such a cord for so little is a mystery. The "clean high-current power" it delivers was too much for my amplifier, which lost control of my loudspeakers two 10" woofers. However, feeding the preamp or CD player, the AC-9 was sweet and dimensional, and a vast improvement over a 14-gauge generic cable. 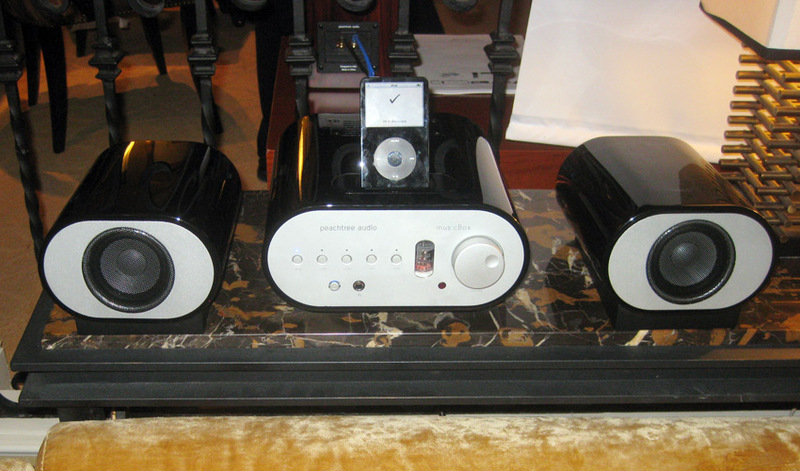 The Pangea AC-9 wins the first Jimmy Award of 2010, for Best Accessory at the 2010 CES. 15. To paraphrase Woodrow Wilsons Vice-President, Thomas Riley Marshall, what this country needs is a good $1400 D/A converter. Bel Canto Design has one! Their e.One DAC1.5 features a 24-bit/192kHz, dual-differential DAC with a dynamic range of 122dB. It has balanced I/O, five digital inputs, an UltraClock, an external DC power supply, a 24/96 USB input, an RS-232 port, a 1/4" front-panel headphone output with independent DAC, a 24-bit digital volume control, and a remote control. (Whew!) Ive owned every DAC Bel Canto has designed, and all have been very musical, at stellar prices. Although the e.One DAC1.5 was on silent display, I bet it will mesmerize listeners for a very simple reason: It competes with recording-studio digital processors at the same price. Continuing a sterling record of achievement, Bel Canto Design wins a Jimmy Award for the e.One DAC1.5, for the Best Value Digital-to-Analog Converter. 14. 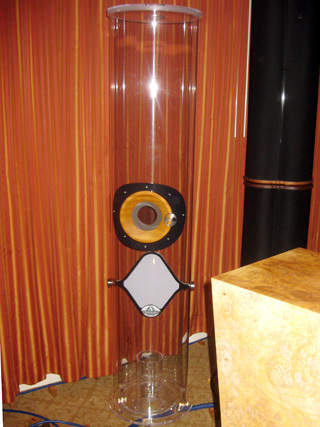 If room-correction electronics are outside your ken, Acustica Applicata de Italia offers "your personal room tuner" -- the towering Polifemo Variable Resonator ($7200 for two; four would be better). Unlike most acoustic treatments, the Polifemo is tuneable, and smooths the most troublesome frequencies between 28 and 70Hz. Its also snazzy in the Italian tradition, resembling a single-driver loudspeaker in a transparent baffle. For making room treatment acceptable to anyones missus (as long as she doesnt see the bill), the Acustica Applicata de Italia Polifemo Variable Resonator wins a Jimmy. 13. Although I have never used a real-time analyzer because of the cost and technical skill involved, I believe any audiophile should have some idea of how loudspeakers react to his or her listening room. Therefore, I was intrigued by the possibilities offered by the Danish company Loudsoft. For the low cost of $300, their FINESPL software enables anyone who owns a personal computer to measure room response. With its huge math capabilities, the FINESPL is more a designers tool than a hobbyists device, but at least two measurements are worth the laypersons attention: simulated anechoic measurements in-room, and SPL and frequency response with phase. I suggest that anyone planning to exhibit at the Venetian for CES 2011 invest in a laptop computer and Loudsoft FINESPL in order to "see" their setup. The Jimmy Award for Best Audio Setup Software goes to the Loudsoft FINESPL. 12. For those to whom the terms streaming, iPod, MP3, and USB storage mean anything, long-established British manufacturer Naim Audio has the proper access device. Their UnitiQute ($1995) draws on the companys expertise in amplifier and preamp design to provide convenience technology with hi-fi sound. The UnitiQute serves as a "digital hub" for game consoles and digital TV as well as ye olde CD player. Computer files can even be accessed wirelessly. Gamers considerate of the needs of others will welcome the headphone socket. 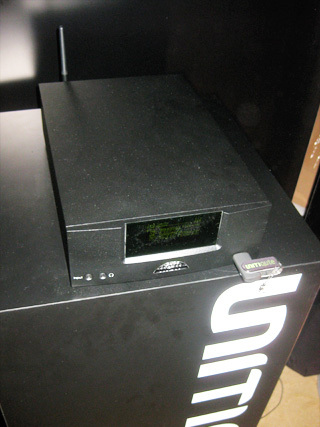 For introducing "new worlds of audio ripe for exploration," the Naim Audio UnitiQute wins a JA. 11. If the Naim UnitiQute is a budget beauty, an even easier recommendation for iPodists is the Peachtree Audio iDecco ($995). Billed as five products in one, the iDecco contains an iPod dock, a 40Wpc integrated amplifier, a tube preamp, a multi-input DAC, and a class-A headphone amp. The iDecco connects to computer files via its USB port. Although its pair of analog inputs will probably go begging, theyll give comfort to owners of cassette decks. One may argue whether this ingenious device indeed "covers the bases like no other product," but for CES 2010, the iDecco merits a Jimmy Award for Best iPod Component. 10. The motto of Swedens Bladelius Design Group, "When silence matters," recalls my first high-end amplifier, the Octave Research OR-1, which went silent so often that it mattered to my wallet. Bladelius, however, lauds a less ominous state derived from a "silent playback system without any moving mechanical parts." Although the sleek Embla source component ($9000) can be used as a CD player, its higher purpose is music storage and playback via internal flash memory. The Embla includes an analog preamplifier, a D/A converter from the companys reference CD player, and a "switchable digital filter with analog behavior." External hard drives can be accessed via USB connection; you can stream music from a computer almost ad infinitum. The Jimmy Award for Most Elegant Computer/Stereo System Interface goes to the Bladelius Design Group Embla. 9. True confession: I could easily live with DALI loudspeakers. In fact, the first-generation Helicon 400 is my all-time favorite in the category of Speakers for Under $5000/pair. Unfamiliar to me until CES 2010, the companys two-year-old Lektor series is said to bring the Helicon experience to a much lower price range. For experienced audiophiles who prefer the sound of paper drivers to that produced by space-age materials, the Lektors lightweight cones of wood fiber boast the longevity of polymers while suggesting the tone of paper. At $1800/pair, the Lektor 8 is efficient (89.5dB), wideband (38.5Hz-27kHz), and well-lunged (112dB!). 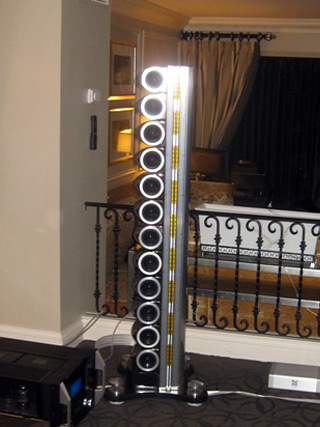 Better late than never, the DALI Lektor 8 earns the 2010 Jimmy Award for Best-Value Floorstanding Loudspeaker. 8. The Blue Light Special Jimmy Award goes to the mhi Evidence minimonitor loudspeaker ($650/pair). Although some may question the practicality of matching the low-tariff Evidence with a scazillion bucks worth of electronics and power-line conditioning -- overkill beyond measure -- the results were intriguing. Im confident that the Evidences 2" aluminum ribbon tweeter provides the basis for a great loudspeaker in any lash-up. The HiVi Swans 2.2Fs in my home system sport a combo of ribbon supertweeter and dome tweeter that provides the most detailed sound Ive ever heard. The Evidences pairing of a full-range driver and wide-range ribbon resides in a similar camp. I would love to mate the Evidences to a Peachtree iDecco, then watch the face of the worlds richest audiophile, the Sultan of Brunei, as he auditioned the system against his will. Such thoughtful technology not only provides great sound but also protects ones investment. The bad-tube indicator alone can save hundreds of dollars in repair costs when blown glass boils a resistor. A Jimmy Award for Best Technology in Tube Amplification goes to the PrimaLuna ProLogue Premium line. Theres no competition. 6. Despite my populist stance on hi-fi prices, one $50,000/pair loudspeaker so impressed me that Id consider buying it. The Scaena 3.2 line arrays depth of image creates a virtual listening room in which the performance "appears" much farther back than experience suggests it would be. As with the Sunny Audio speakers of 2009, I was so taken with the effect that I neglected to assess the truth of timbre, which Ill leave others to judge. Also, a few years ago, I was crazy about a line array from a design predecessor, Pipeline, that never quite came to fruition. Nevertheless, Ill risk my reputation as a golden ear by honoring the Scaena 3.2 with a Jimmy for Best-Imaging Loudspeaker at CES. 5. Among a few strong candidates for Best Sound at the Show was the YG Acoustics room, where their new Carmel speakers were being demonstrated. At $18,000/pair, the Carmels produced about 90% of the performance of YGAs flagship speaker, which sells for $107,000. I love that kind of math! My visit to the YGA room on opening day alerted me that I might have already found the Overall Winner. However, when I went back on the last day of the show, I was disillusioned: The YGA system didnt pass the MK Torture Test. * I suspect the room was to blame for a touch of lower-midrange congestion; strategic room tweaking may have allowed the Carmels to conquer. Despite missing the Best Sound Award, the YG Acoustics Carmel wins a Jimmy Award for Best Trickled-Down Design. * Mark Knopflers voice as he sings "Border Reiver," from his new album, Get Lucky, challenges a systems midrange/bass crossover region. In a wayward setup, the words are veiled by low frequencies. SoundStage! Network writer John Crossett, who supplied the music, said the lyrics are intelligible through his loudspeakers, as they are through mine. But in most rooms at CES, MK sounded as if he had lockjaw. 4. The Best New Amplifier Design goes to Audio Research Corporation for their DS450 power amplifier. Unlike most hybrid amps, the DS450s input stage doesnt include a tube. Rather, the amp mixes a linear analog power supply with a high-speed analog switching MOSFET output stage. I guess such a pairing qualifies as "hybrid." However, should anyone ask me what hybrid means in this context, Ill say: "A class-D amplifier that sounds as if its a transistor amp with a tube in it -- a very big tube." Unlike most switch-mode amps, the DS450 weighs a hefty 60 pounds and also puts out 450Wpc into 8 ohms. The DS450 drove a pair of handsome Sonus Faber Elipsas ($20,000/pair), and the sound was authoritative, with huge amplitude swings. I cant wait to test the amplifier with my "hybrid" ribbon loudspeakers. At $7995, even your faithful scribe can afford a DS450, the Best Amplifier Value at CES. Wait -- thats two Jimmys for a single Audio Research product. Well, so be it. With so many rookies and charlatans hawking overpriced wares these days, I think ARC should be honored for producing the Best Hi-Fi in the World at a Fraction of the Price. That makes three Jimmy Awards -- and counting. 3. So much has been written about the stupendous music and video presentation in the Paradigm/Anthem room that I will add here only that I never heard so much deep bass come and go so quickly. This rooms jump factor was by far the most startling of any CES Ive attended in 20 years. Anthems Statement D2v preamplifier-processors room-correction software had a major hand in the effort, enabling Paradigms setup experts to utilize the speed and power of their magnificent six-driver Sub 2 subwoofer ($7499) without giving an impression of the bass having a life of its own. After the mesmerizing demonstration of k.d. lang singing in surround sound in the Paradigm demo, Im almost ready to go multichannel in my music room. For the second straight year, the Paradigm/Anthem room wins a Jimmy Award for Best Surround Sound System at CES -- and maybe in the world. 2. When I first heard a Boulder Amplifiers demo, five years ago at the old Alexis Park, I was underwhelmed. In 2010, I was in awe. The nimble sweetness of the music in the Boulder room was as good as a digital solid-state system gets. 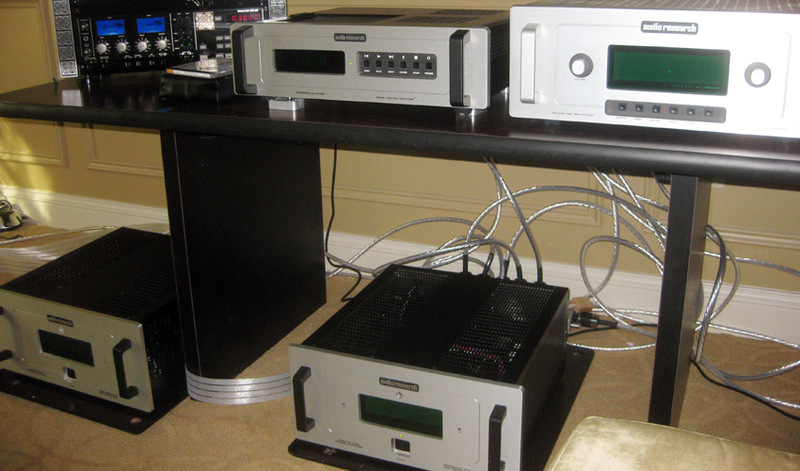 I attributed much of the effortless playback to the source component, Boulders 1021 disc/network player ($24,000), which sent digital information directly to the preamp without spinning a disc. I would love to compare the 1021 to the less costly Bladelius Embla to see how the two technologies compare. The rest of the Boulder system consisted of their 1060 stereo amplifier ($24,000) and 1012 preamp-DAC ($19,000), and Focal Maestro Utopia speakers ($60,000/pair). The Boulder room was a friendly oasis for the ears that I was reluctant to leave. Although I would never pay over $60,000 for any stereo system, Boulders "entry-level" components comprise a much better deal than some of the really expensive systems I heard and hated. 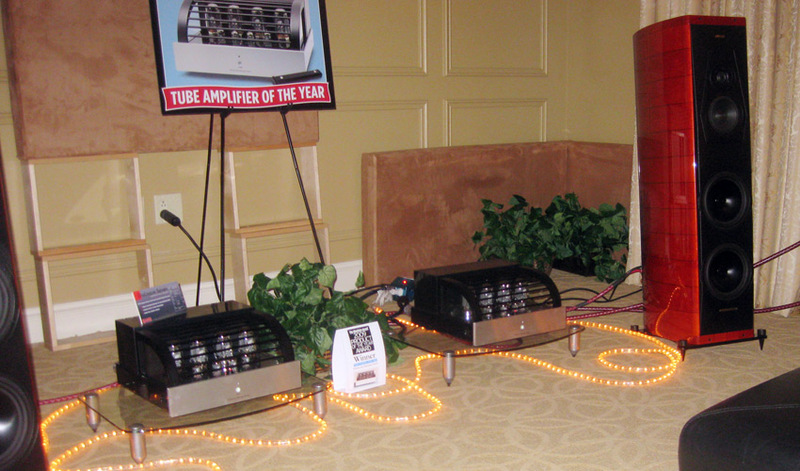 The award for Best Solid-State Sound at the Show goes to Boulder Amplifiers. 1. And now, the envelope please: The Best Sound at the Show Jimmy Award goes to . . . Audio Research? Yes, in a way. Thats because their fabulous Reference 5 preamplifier ($10,000), fantastic Reference CD8 CD player ($10,000), and first-class Reference 210 monaural amplifiers ($20,000/pair) were in the employ of legendary loudspeaker designer Carl Marchisotto, in the Accent Speaker Technology room. There, the new Nola Metro Grand Reference ($22,000/pair) produced a sound to stir the hearts of angels. In mundane terms, the systems airiness, truth of timbre, and dimensionality provided a musical anodyne worthy of the River Lethe. The system even breezed through the MK Torture test, which subverted many a demo. Is it coincidence that the Metro Grand Reference uses a ribbon tweeter? As far as Im concerned, only ribbons can do treble with any semblance of reality -- and the Metros champion alnico midrange driver is another ingredient of the speakers higher resolution. Yet another crafty design feature is the use of a separate chamber for each of the two bass drivers. Such isolation not only keeps the bass taut and tuneful, it also negates midrange colorations. Attesting to Don Carlos acuity in exhibiting at shows, the sweet spot in the Nola room was in the nearfield. A result of all this expertise was that the Nola setup was the only one I heard that had no obvious need of room treatments or frequency correction. The Nola Metro Grand Reference room deserves the highest Jimmy Award: Best Sound at the Show. As I shivered and cringed at this years hi-fi prices, I recalled my days on Wall Street, where we traded bonds based on relative value. That is, if similar securities were dissimilarly priced, we bought the bond that cost less and sold the one priced higher. Too bad this sort of trading doesnt work in the hi-fi market. If it did, Id buy blue-chip products that are fairly offered, and short-sell newbie items bearing logic-defying price tags. For instance, an old-line company like Convergent Audio Technology has for years offered one of the worlds best preamplifiers. Today, their pedigreed Renaissance model costs $10,000 -- a lot of money, to be sure, but in comparison to unproven (and perhaps underdeveloped) preamps selling for twice that, its a bargain purchase. The same is true of reference products from Audio Research, Naim Audio, Nola Loudspeakers, Anthony Gallo, Simaudio, and Bel Canto Design, to name a few established firms that provide great value for money. Why pay as much as six figures for a product with a short or no gestation period, when established high-end companies offer excellent evolutionary designs for ten grand or less? I suspect it has little to do with the music. To those audiophiles who appreciate the price/performance ratio of a CAT Renaissance preamp, a Simaudio Moon Evolution amplifier, or an Audio Research Reference CD8, I salute your perception of Relative Value with a hard-earned Jimmy Award.